Appliance Warehouse of America makes it easy for your community or corporate office to provide in-home/apartment laundry equipment to your residents. Under our "Community Direct" program, we lease you the laundry equipment and you provide the equipment to your residents at the rate you choose. • Ancillary income for you! • Online account access - schedule deliveries, removals, service, and check inventory - online! • We do it all - easy, fast, and hassle free! If you are a current client you can log into your account by clicking on the Customer Login above. If you are an apartment community, management company or corporate leasing office and would like more information about these great programs, call our toll free number to speak with your local account representative or simply click here for an e-mail follow up. 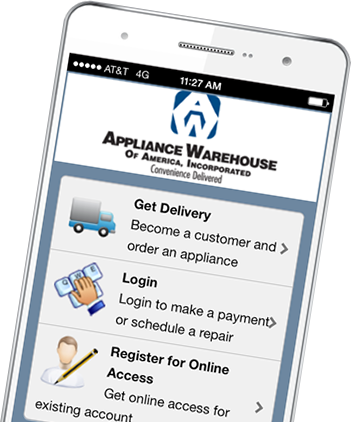 With a "no cost to you" customized program... Appliance Warehouse is Convenience Delivered!